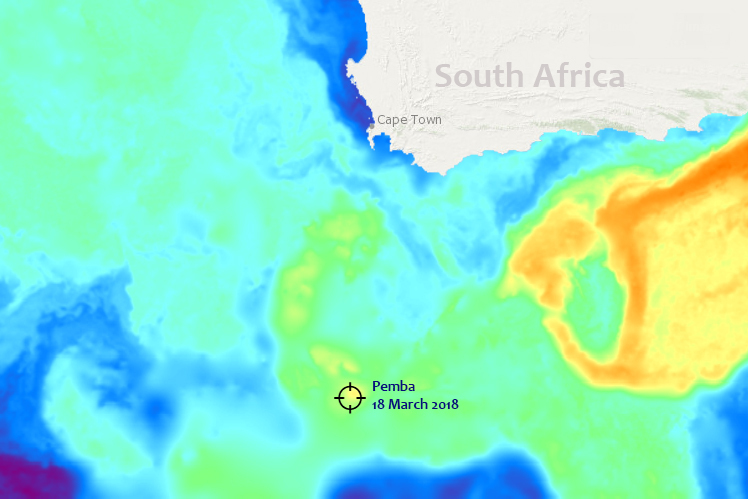 Pemba has been exploring the deep sea about 600 km South of Cape Town for the past 3 weeks. 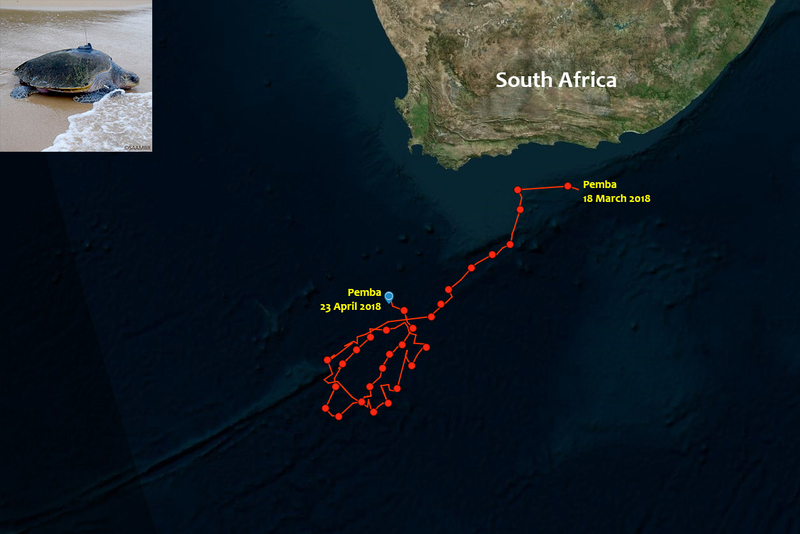 She traveled at quite a remarkable speed down the Agulhas current and has since moved around in 2 very big loops just below the tail end of this mighty current. She has managed to maintain a good pace by some days using the currents, but many days swimming against the currents. The water temperature is 20.7’C, not as warm as off KwaZulu-Natal, but still well within an acceptable range. The sea depth at her current location is around 4800 meters. Pemba moves between some sea mounts, should have great opportunities to feed. Pemba has traveled over 4 626 km since her release in Mabibi on 8 March 2018. That averages about 105 km/day. While in the Agulhas current she managed to travel 142 km/day – thanks to a fantastic ocean conveyer belt. Since reaching the lower part of this current, she has reduced her speed and has covered about 74 km/day – which is still very impressive. Her shortest day over the last 3 weeks was 27 kilometres, with her longest day a 179 km. While in the Agulhas current, Pemba traveled 224 km in one day. 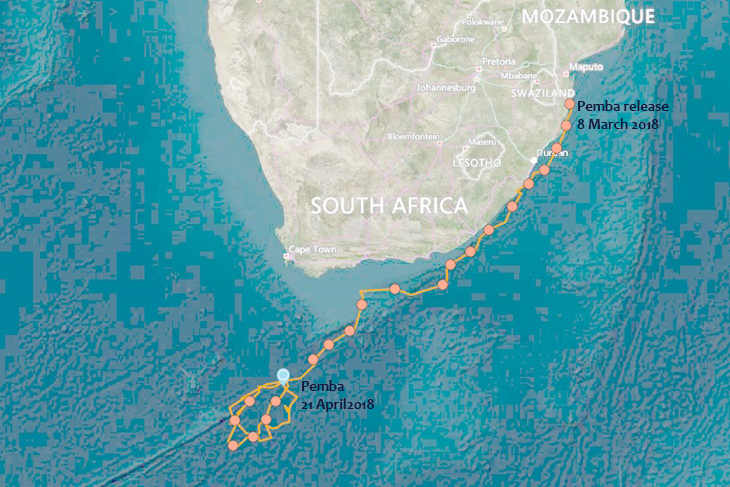 Pemba’s ‘loop’ has a radius of about 130 km, so she is still covering a lot of distance even in this area. We have received 219 satellite transmissions. We are all still holding our breath to see which direction she will be heading. There are Olive Ridley nesting sites along West Africa (Angola, Gabon), Brazil in South America, Mexico and California along the West Coast of America, and around Malaysia, Indonesia and India. There are also minor nesting beaches along Australia. Where will Pemba be going?